Elizabeth Losh is the director of the Culture, Art, and Technology program at the University of California, San Diego, where she teaches about graphic novels, media theory, digital writing, and professional communication. She is the author of Virtualpolitik: An Electronic History of Government Media-Making in a Time of War, Scandal, Disaster, Miscommunication, and Mistakes (MIT Press, 2009) and The War on Learning: Gaining Ground in the Digital University (MIT Press, 2014). For Bedford/St. 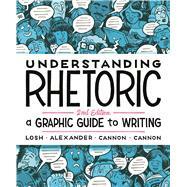 Martin’s, she is the co-author, with Jonathan Alexander, Kevin Cannon, and Zander Cannon, of Understanding Rhetoric. Jonathan Alexander is Professor of English at the University of California, Irvine. He teaches courses on writing, graphic books, science fiction, and sexuality—sometimes all at the same time. In 2011 he won the Charles Moran Award for Distinguished Contributions to the field of Computers and Writing. The author, editor, or co-author of nine books, his work focuses primarily on the use of emerging communications technologies in the teaching of writing. He is the general editor of College Composition and Communication. Illustrators Kevin Cannon and Zander Cannon have worked for clients ranging from the National Oceanic and Atmospheric Administration to DC Comics, collaborating on such titles as The Replacement God and Smax and winning two Eisners for their work on Top 10.